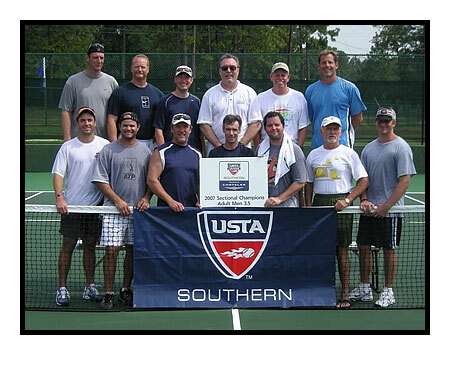 Congratulations to Mike Hammond (Captain) and team for winning the 2006/2007 USTA 3.5 Sectional Championship. It’s been a long road here so far and we’re not yet done. One final step to go as we attend the National Championship in October in Las Vegas. But before I get ahead of myself, here’s a picture of the team. After winning the league title 4-1 at Dekalb Tennis Center in August of 2006 to earn the bid to the May 2007 district championship in Augusta, we posted a solid record of 8-0, 33-7 at state, playing 8 team & 40 individual matches in 4 days. That win allowed us to move onto the sectional tournament during July in Mobile, AL. We were one of ten teams from nine southern states that played 5 team & 25 individual matches in four days. We had a mighty fine result there as well, going 5-0 and 22-3 to claim the right to play in the national championships with a Las Vegas venue at the Darling Tennis Center, home of the Tennis Channel Open each year. We will have to play superbly there to have a chance to win it all, since our competition will be 16 other sectional champions like us and our squad will unfortunately be missing 4 of our best players, who were all undefeated in tourney play to this point. I will follow up here with those results when we return in early October.